North Canton, OH, December 04, 2017 –(PR.com)– During the 2017 season, Team Sahlen, presented by honeybeeBase.com, competed in 3 different endurance sports car series: American Endurance Racing, World Racing League and ChampCar Endurance Series. Each series offered a unique set of car specs and competition rules that the team had to adjust for. “To win at these long endurance events requires both speed and reliability. Having five different race cars come through to secure Overall Victories is mark I find the most satisfying. The crew does such a fantastic job preparing our Team Sahlen race cars so they can run the full distance. And then to be able to extract the speed from not just one but five race cars is not always easy, but is most certainly a gratifying achievement,” shared car chief Tony Artino. “We have been very fortunate to race in a wide variety of series. And even more fortunate to have secured victories in each of those series. What has been constant throughout our team’s history in sports car racing is that we have always enjoyed the long endurance race format. And the three series we currently compete in, American Endurance Racing, World Racing League and ChampCar Endurance Series, embrace this philosophy at their core. Our team can hardly wait for the 2018 season to start up again. We will be working hard in the off season to hopefully equal or surpass our achievements from these past two seasons. 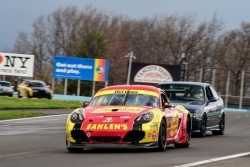 But no matter what, you can guarantee that everyone at Team Sahlen will be having the time of our lives racing these long enduros,” shared Will Nonnamaker.